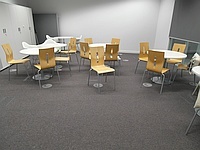 Services / facilities within the building include Student's Association office, meeting rooms and student common space. Related link City Campus Building. Related link Student's Association Cafe. 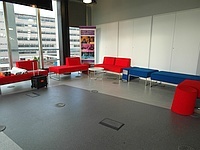 The Students Association is located at the front of level 2, to the right as you enter. 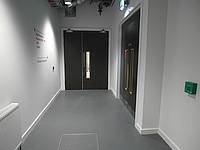 It joins with the Student's Association Cafe, or can be accessed from the right near Student Services, at Stairway F.
It can be accessed from the ground floor entrance via the accessible lift, or the standard lifts off the ground floor corridor. 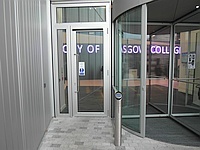 The city campus is located in central Glasgow, off Cathedral Street which is fairly close to the M8 motorway. 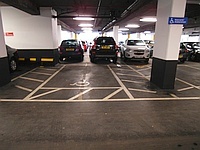 There is Blue Badge parking beside the building on level 2. 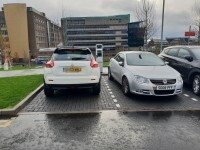 There is an on-site car park for permit holders nearby. Blue Badge and standard on-street parking is available nearby. A public car park is available nearby. The campus can be accessed via a number of bus routes, including buses X3, X11, X19, X25/A, X28, X37, X39, X85, X86, X87, 13/A, 19/A, 38/A/B/C/E, 57/A, 213, 240X, 832, 833, 834, 837, 839, 840, 866. The nearest railway station is Queen Street. 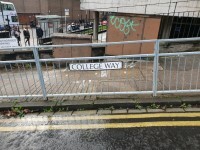 However, all of the central Glasgow stations are within reach of the campus using public transport. The nearest subway station is Buchanan Street. Please see the Campus Locations and Contact Us page of the College website for more information on getting to the campus. The Strathclyde Partnership for Transport website for details on buses and the Subway. The National Rail Enquiries website for details on trains to the Glasgow Stations. To see more information on Equality, Diversity & Inclusion please click here (opens new tab). Telephone Number: 0141 375 5401/5402. To see more information on Help Choosing A Course from Professional Careers Advisors please click here (opens new tab). Telephone Number: 0141 375 5172 or 0141 272 6578. To see more information on Accommodation please click here (opens new tab). Telephone Number: 0141 375 5533. Disposable puppy mats are available from reception for assistive dogs. An outside toilet area will possibly be added in the future. The car park is located at the side of the building, on level 2. 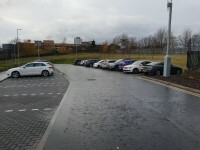 There is/are 10 designated parking bay(s) within the car park. The Blue Badge bay(s) is/are signposted but have no markings. 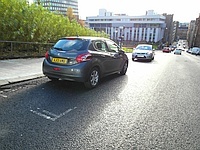 The dimensions of the designated parking bay(s) are 430cm x 601cm (14ft 1in x 19ft 9in). The nearest designated bay is 13m (14yd 8in) from the main entrance. 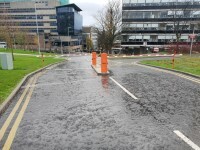 There is a site/campus car park for staff, students and visitors within approximately 200m. 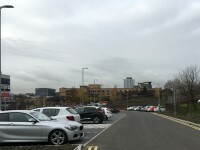 The name of the car park is City Campus Car Park. 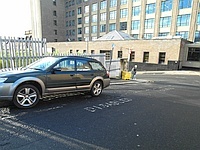 The car park is located further towards the city centre, off Cathedral Street. 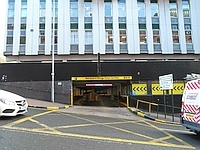 The name of the car park is NCP George Street Car Park. 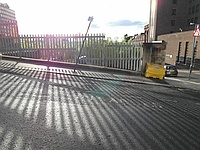 The car park is located off Montrose Street. Clearly signed and/or marked on street Blue Badge parking bays are available (within approximately 50m of the building). The dimensions of the marked Blue Badge bays are 220cm x 550cm (7ft 3in x 18ft 1in). 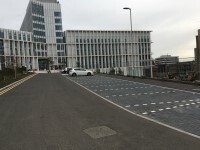 The on street Blue Badge parking bay(s) is/are located on Rottenrow. 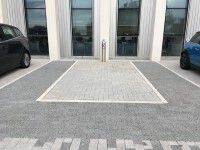 The dimensions of the standard marked parking bays are 270cm x 700cm (8ft 10in x 22ft 12in). 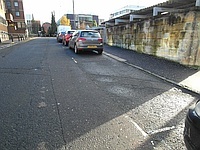 The on street standard parking bay(s) is/are located on Rottenrow and Montrose Street. There is a designated drop off point. 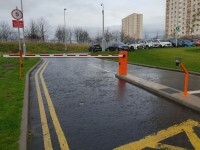 There is not a dropped kerb from the drop off point. The drop off point is located in the turning circle of the building car park, near the main entrance. 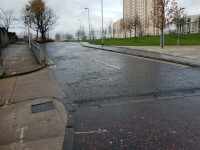 There are steep gradients on Montrose Street/Rottenrow. You are on Site/Campus Car Park. Skip to the next section. 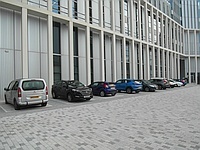 The car park is located on College Way, off Cathedral Street, to the left as you face the City Campus Building. 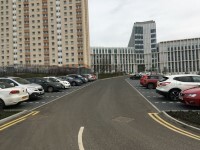 The nearest building(s) to this car park is/are City Campus Building. Designated Blue Badge parking bays are not available. This car park can be used by permit holders. Signs are not provided to give information on parking charges/restrictions. There is not a designated drop off point in this car park. 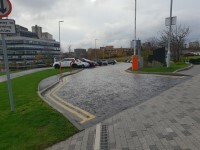 There is sloped access to the car park from the City Campus Building. This car park is not clearly signposted from the City Campus Building. An intercom security barrier is in operation. 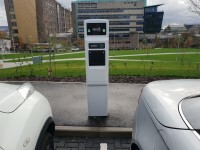 There are 2 spaces available with a charging point for electric cars in the car park. 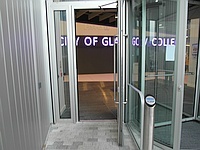 You are on Outside Access (Main Entrance - Level 2). Skip to the next section. This information is for the entrance located at the side of the building, to level 2. The door(s) is/are push pad activated. 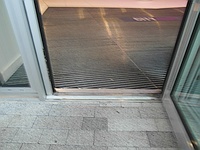 The width of the door opening is 85cm (2ft 9in). 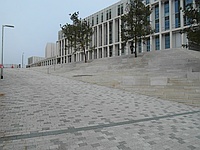 The ramp/slope is located leading up to the car park from Cathedral Street. The ramp/slope gradient is steep. 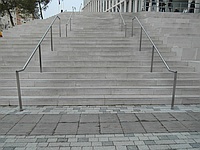 The step(s) is / are located leading up from the slope towards the entrance. 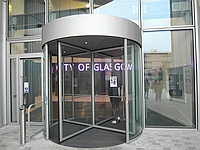 There are heavy 135cm wide revolving doors to the right at this entrance. You are on Entrance (Office). Skip to the next section. This information is for the entrance located to the rear left of the area. You are on Entrance (Stairway F). Skip to the next section. 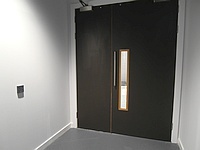 This information is for the entrance located to the right of the area, near south west Stairway F.
There is one set of manual, heavy, double doors between the main entrance and this entrance. The card reader/lock is in a suitable position to allow wheelchair users to gain access. The door(s) is / are single (with a locked extension leaf). 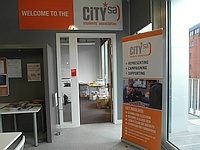 Students' Association is located in the office to the left. The desk is 4m (4yd 1ft) from the Students' Association office entrance. Clear signage for the reception area is visible from the entrance. There is not a clear knee recess beneath the low counter. 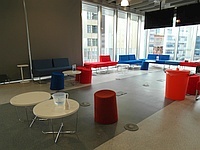 There are also some low desks outside the office which may be used. There is step free access throughout the area. There is good colour contrast between the walls and floor in all corridors. Portable hearing loops are available from the Disabled Store, located on the first floor of the City Campus Building. 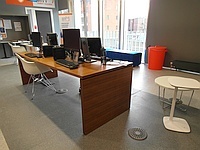 The nearest accessible toilet is located within the main building, adjacent to the students' Association Cafe. 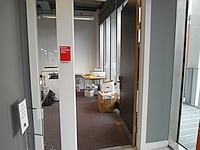 There is also an accessible changing room with accessible toilet in the south west corridor. The nearest standard toilets are located within the main building, near the front lifts.